Time-tested, maintenance-free design will serve you for years and forever satisfy your customers with the tastiest, juiciest hot dogs. 360 degree roller rotation prevents residue build-up and electric power requires no ventilation system. 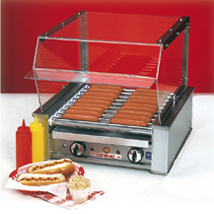 Features include removable drip pan for easy cleaning and seven heat settings for versatile temperature control. Add a stackable bun warmer and sneeze guard for a complete system. Available in 10, 18 or 27 hot dog capacity.